Licensed and Insured, Inspect Florida is dedicated to our clients. We excel in providing Fast and Reliable Home Inspections each and every time. 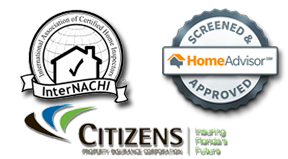 We offer Wind Mitigation Inspections, 4 Point Inspections, and Citizens Roof Certification Form RCF Inspections for Home Insurance purposes. Our inspections can be completed and in your hands by the end of the next business day in most cases. We provide Inspections for Insurance Agents and Current Home Owners, Mobile Homes included. Schedule your Insurance Home Inspection Today! Its quick and easy! Simply give us a call to get started. Choosing Inspect Florida for your Insurance Home Inspection is a no brainer and here is why. We can Save You Hundreds of Dollars per year with our Wind Mitigation Inspection. Calculate Savings Now! Our prices are the most affordable in the industry. If you find a better deal we will refund the difference. Our goal is efficiency, your inspections are completed and emailed to you next business day in most cases. We provide Home Insurance Inspections for Pinellas, Clearwater, Largo and most of the surrounding Tampa Bay areas. Whether you are an Insurance Agent or a Current Home Owner in the Tampa Bay area, Inspect Florida can provide you with the Residential Insurance Inspection Service you need and the savings you deserve. Citizens Roof Condition Certification Form or RCF Inspection. Inspect Florida helped me save $1200.00 a year on my home owners insurance! I cannot thank them enough for informing me about the Wind Mitigation Inspection. The inspector was on time and very helpful with my questions. I would highly recommend them to anyone interested in saving money on home insurance. Can I just tell you how much easier you guys are to work with than EVERY other inspector I’ve encountered? It makes a huge difference to be able to send someone to you and know that you guys will take care of them quickly and get us the information we need in the right format the first time. (Can you tell I’ve been screaming at another company—who shall remain nameless—for three weeks and they STILL got the photos wrong? AARGH!) Anyway, just wanted you to know that we are grateful to be working with you guys and appreciate your professionalism and efficiency.